This is very bright on a TFT XD . It's a good idea and a nice scene though and the character looks sweet. Good work for 2 hours. Anyway, it's a nice wallpaper, the idea is original as well lol, different from an usual scenic bg, that's for sure ^^. two things: I can see like a sharp lines at the top behind the clouds... I guess that is the "border" of the stock photo that you used, you could try covering that with a layer and colour it with azure/blue tones ;). The text is ok except the tree, that I woukd have replaced with the same swirls you used for the lower part (flipping it horizontally). It does transmit a feeling of taking a moment appart from all worries and work in order to rest a bit, Nice and calm. Wow bright... I like it. Very nice work for only 2 hours. The Character looks very cool. 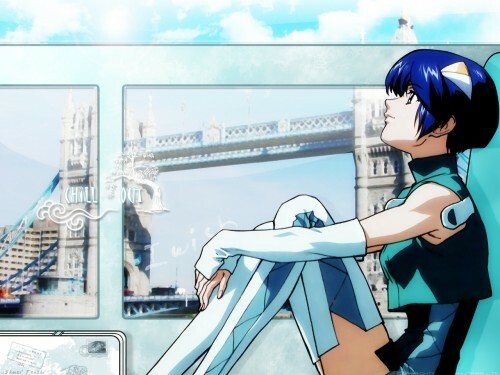 And of course the background is nice cause... hey its london, how can you go wrong? Very nice and interesting wall. Great job! i really love it. The effects are very nice. I also love the chara and the wp quality. wooww really great!! background is amzing and this girl is soo cute too!! I llike it soo much!! *jaws fall on the ground* otsen horosho, tõ otsen pro waller. Now this wallpaper is a total 'style mile' . A rock solid favorite from me. I love the setup the wall and it's really relaxing to look at. You did a nice job on the bg and the extraction. It matches so well and the colors are really nice. Blue~ My fav part has to be what's on the wall. That's a cool postage stamp. This is really awesome! The work is pretty good as far as i can see from the full screen. However i feel that the bg can be enhanced more. it looks filtered at the moment. Mayb makin it less obvious will add more to the wall. You've created a calm smooth atmosphere! nice wallpaper, the background looks great, i like it, and the chara looks good too. Horray, a Scryed wallie and it's from my fav abstract waller, Shuei-san! :D I see the BG has a unique techy but more artistic vibe which is a pretty killer mixture and the aqua colors blends so well with the bule character! Kinda make the overall wallie refreshing like an ice cold glass of water! XD Way to go, Shuei!